Greetings all you ghouls and fools and welcome to another frightastic Friday!!! This weekend a remake of a near and dear film that the gang here at good ol' PU regards as one of the jewels of 80's horror flicks is finally out to give you the shakes and shivers - EVIL DEAD. Back in 1981, two high school friends who met in their 1975 drama class, Sam Raimi (director of Spider-Man, Oz the Great & Powerful) and Bruce Campbell (Evil Dead 1, 2, & 3, Bubba Ho-tep) got together to create one of the most ghastly epics in horror history. The original Evil Dead set up the story of five friends who stumble across the 'Book of the Dead' upon their visit to a lone cabin in the woods and unwittingly unleashing a band of body possessing demons. The latest incarnation keeps it all in the family as Bruce Campbell, star of the original (better known as the chainsaw-hand wielding demon slayer, Ash Williams) plays the role of producer along with his longtime friend Mr. Raimi as they hand over the directing reigns over to first time director Fede Alvarez. Check out this terrifying trailer! Staring as the five doomed friends are Jane Levy, Shiloh Fernandez, Lou Taylor Pucci, Jessica Lucas, and Elizabeth Blackmore as history repeats itself along with new surprises along the way. Fear not fans of the original Evil Dead series! Rumor has it that both Sam Raimi and Bruce Campbell have stated that they are both interested in continuing where Evil Dead: Army of Darkness left off! "Well there's no Ash character. We have photography that's crisp and in focus. The sound is good and in stereo. The movie was made all the way through without stopping," said Campbell, who serves as producer on the new film. "Yeah, sounds too easy. And just a whole new cast but familiar aspects: the book, a cabin, one long, nasty night." Fede Alvarez said he's hoping that Sam Raimi will direct another sequel to his own "Evil Dead" trilogy, which ended with "Army of Darkness" in 1992. From there, the two can perhaps merge both the original cast and star with the young new actors. "Now I think he's excited when he realizes whoa, there's a big audience out there that loves Evil Dead. So now he's probably very excited about doing a new one with Bruce as Ash and coming back to the Evil Dead universe," Alvarez said. "Ideally, we'll make both movies at the same time. I may continue to make another Evil Dead and then we'll unite both sagas in a way – Army of Darkness and Evil Dead into a final one. That would be awesome." Campbell agrees with the plan – but says the latest "Evil Dead* has to be a hit first. So shamble on over to your nearest theater kids and lets make this the success story it needs to be! Let's face it, with Campbell and Raimi as the godfathers of this new project, it's sure to give you nightmares for months on end! 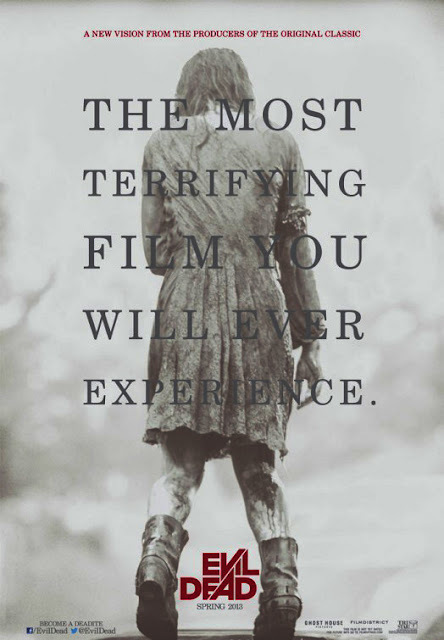 Evil Dead 2013 starts today at a darkened theater near you! BONUS!!! Check out the original 1981 trailer below!! !